Vey system, Placid region. 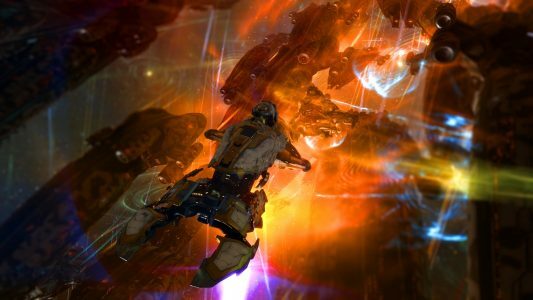 On the morning of the 18th of December, a major battle erupted in the system over an Escalating Entropy [CHAOS] Keepstar citadel. The battle itself saw more than 3,000 players clash in a spectacular brawl over the onlining structure, as two makeshift coalitions sought victory in what quickly became a meat grinder. The chain of events that led to the battle started with Escalating Entropy wishing to construct and deploy a Keepstar citadel of its own. The structure, which allows even super capitals to dock safely, is quite an expensive and complicated project, requiring many hours of work and boatloads of ISK. However, the alliance set it as one of its goals and invested vast resources in order to accomplish it. With the citadel ready to deploy, the original plan called for the structure to be deployed after the new year as the holiday season was coming up and player activity usually drops. That said, the leadership of Escalating Entropy was getting antsy with the citadel in its possession. Deciding to rush it, Escalating Entropy informed its allies and a few associates about its decision to deploy the structure ahead of schedule. Picking a date and a time, the alliance set things in motion. With the Vey system serving as Escalating Entropy’s staging area, hostile scouts are ever present, keeping tabs on Escalating Entropy’s movements. Realizing the first hurdle would be deploying the citadel successfully, Escalating Entropy set up multiple decoys in order to throw off the scouts. As the freighter carrying the citadel got in range of the system and prepared to be bridged in, dozens of cynosural beacons were lit all over the Vey system in order to confuse the enemy. The freighter itself bridged to the spot where the citadel was to be erected, but due to game mechanics was unable to deploy the structure until the cynosural beacon finally burnt out. This left Escalating Entropy in a bind, as combat probes were deployed by Snuffed Out [B B C] scouts who realized what was going on. At the same time, a small trusted group of Snuffed Out pilots prepared to jump into the system in dreadnoughts for a suicide attack to deprive Escalating Entropy of its prize. Thinking fast, Escalating Entropy managed to secure a Charon freighter in the system to act as a double. While the original freighter warped to a safe Fortizar in the system to wait for the cynosural beacon to go out, the other freighter warped to a safe spot in order to draw off the Snuffed Out scouts. As combat probes began homing in on the decoy, Escalating Entropy could breath a sigh of relief. Regardless, the alliance organized its defense fleet; a Proteus strategic cruiser fleet augmented by an entire super capital wing to meet the incoming dreadnought attack. The Snuffed Out scouts had the decoy freighter probed down and warped a Venture industrial frigate to its signature. The frigate exited warp, landed near the ship and tackled it immediately. A cynosural beacon lit up and into the system jumped six Snuffed Out dreadnoughts and a black ops battleship. The capitals entered their siege cycle and opened fire on the freighter in order to destroy it and its cargo, which they believed was the still-packed citadel. Alas, as the freighter blew up, unable to withstand the firepower of the dreadnoughts, its kill mail proved that its hangars were empty! At this point, the Escalating Entropy fleet warped in. The strategic cruisers swarmed the immobile capitals while their own capitals and super capitals landed. Doomsday devices and fighter bomber squadrons ensured the demise of the Snuffed Out force, with only the black ops battleship managing the escape the carnage. While the Snuffed Out force was destroyed, the original freighter left the citadel and went to deploy the structure safely. 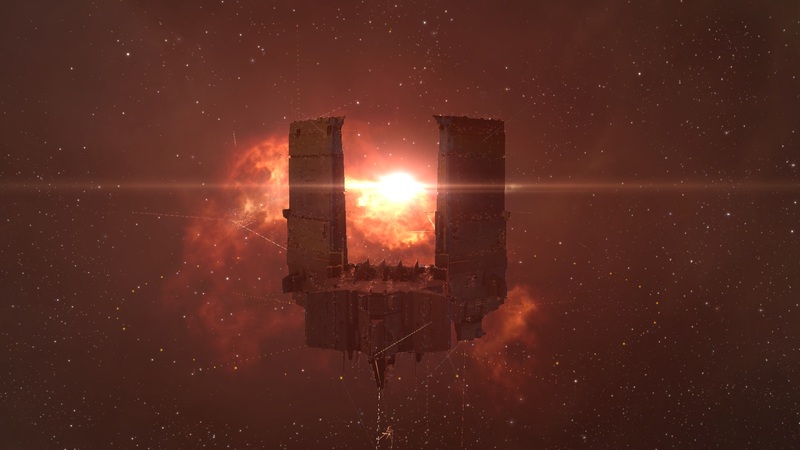 With the Keepstar core anchoring, the structure was slowly fabricated around it, allowing Escalating Entropy a 24 hour respite. However, once it finished the process, it would be vulnerable for a period of 15 minutes before it would start its programmed invulnerability cycle. This meant that the day after, the alliance would have to defend the anchored structure as it came online or risk losing it to any potential enemy. With Snuffed Out already aware of the structure and the two alliances engulfed in a long and bloody feud, there was no uncertainty as to what would follow. Snuffed Out would return, with allies, and try to destroy the Keepstar. Escalating Entropy would have to prepare for an all-out assault. Escalating Entropy was not bereft of friends. Allied with Shadow Cartel [SHDWC], the alliance had also coordinated the event with members of the New World Order (NWO). This loose coalition involves Pandemic Legion [-10.0], Northern Coalition. [NC], Mercenary Coalition [MC], Pandemic Horde [REKTD] and the Guardians of the Galaxy (GotG) coalition among others. With the timer set, the various alliances planned the upcoming defense of the citadel. The original plan called for Shadow Cartel and Escalating Entropy to supply the bulk of the super capital and capital fleets, while the other entities brought sub capital fleets in support. This plan was changed at the last minute, as scouts reported a massive movement of capitals in the vicinity of the citadel. With the news of the anchoring citadel spreading throughout New Eden, and Snuffed Out calling the banners, a makeshift coalition emerged to destroy the citadel. Besides Snuffed Out and their allies Project.Mayhem. [16-13], Pen Is Out [WANGS] and WAFFLES. 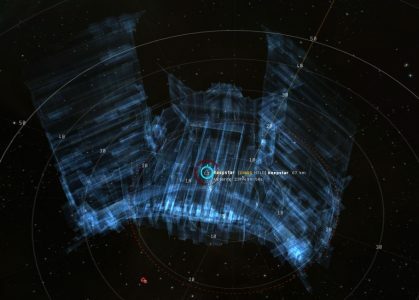 [N0MAD], Goonswarm Federation [CONDI] had decided to join the attackers. Alongside it also came The Initiative. [INIT.] and, surprisingly, Test Alliance Please Ignore [TEST]. This ramshackle coalition began gathering their forces for the attack, moving capitals, mainly dreadnoughts, into position. At this point, estimates vary. While Snuffed Out and its allies have confirmed 100 dreadnoughts were in position and ready to join in, Goonswarm Federation was said to have moved 100 dreadnoughts of its own for the fight. However, no confirmation was given, thus putting the number of attacking dreadnoughts anywhere between 100 to 200. Even so, with such a number of dreadnoughts ready to join in, the joint Escalating Entropy/Shadow Cartel super capital fleet would be in grave danger, not to mention the citadel itself. What’s more, it seemed as though Goonswarm Federation was putting its super capital fleet on alert and might actually deploy it to the fight. With this information, the NWO changed its initial plan. While Escalating Entropy and Shadow Cartel would field a capital force for the Keepstar’s defense, they would hold their super capitals in reserve while Northern Coalition and Pandemic Legion moved their own substantial super capital fleets in range of the system, ready to counter escalate if necessary. Thus, the two alliances would not form a sub capital force, entrusting the task of support to other members of the group. With Pandemic Legion and Northern Coalition forming their own super capital fleets, the possibility of a super capital clash diminished, as many believed Goonswarm Federation would not risk its super capital force, especially for a citadel that posed no short or long term strategic threat to its domains in the Delve region. As the time passed, the two sides started assembling their forces and moving them into position. Against this the attackers had formed eight fleets. While exact numbers are hard to come by, Snuffed Out, Project.Mayhem and Pen Is Out formed a joint Machariel fleet, with the Initiative supplying a Machariel fleet as well, while Goonswarm Federation brought two, though the second was smaller in comparison. WAFFLES and Test Alliance Please Ignore each brought a Nightmare battleship fleet, and Goonswarm Federation also had a Proteus fleet and a frigate fleet acting as a massive electronic warfare wing. On the morning of the 18th of December, at 4:00 EVE Standard Time to be exact, the first shots of the battle were fired. The two sides collided above the anchored citadel, exchanging devastating blows from the onset. The defenders initially fielded only their capital and sub capital forces. The capital armada unleashed hundreds upon hundreds of fighters while battleships, battlecruisers and strategic cruisers waited anxiously for the battle to commence. The attackers did not disappoint, and their sub capital armada warped to the Keepstar. 600 battleships landed, artillery cannons and beam laser batteries prepared to fire and start a colossal battle. As the two sides anchored and started burning to optimal firing range their various fleets began the exchanging. Artillery shells and laser beams plunged into the ranks of the defending fleets, focusing on the sub capitals. In response, fighters surged forward, accompanied by returning fire, and tore into the attackers. With so many fleets on field and each possessing formidable firepower, logistics wings proved to be wholly ineffective. The capital fleets enjoyed the protection of the thick armor of their combat carriers, which, backed by squadrons of force auxiliaries, proved impervious to all attacks. Their sub capital brethren did not enjoy such luxury. Defending Maelstrom and Machariel battleships were easily volleyed, coordinated strikes of beam laser batteries or artillery cannons ignoring robust shields and layered armor plating. The same fate was shared by the attackers’ ships. Machariels would disappear in firestorms, leaving behind only perforated wrecks as the defenders returned fire. Back and forth the murderous trade-off went, battleships on both sides disappearing in a fireball, illuminating the grid for a second before being snuffed out by the cold vacuum of space. The fleets themselves settled into a rhythm of following broadcasts, locking the indicated ships and firing away before moving to the next target. At the same time, the support fleets started a secondary engagement as the two sides raced to clear electronic warfare from the grid. Maulus, Griffin and Crucifier frigates were felled in droves as tackle wings swooped in and started dozens of independent engagements on the grid, adding to the confusion and overall destruction. The countless fighter squadrons proved to be a huge problem. Though slow in reaching their targets, the fighters could apply a lot of damage, not to mention having little restrictions when it came to range. Battleship after battleship was ripped apart by the fighters’ fire. In order to counter this, several of the attacking fleets changed their targets to focus solely on the fighter swarm. Countless munitions were spent trying to fend off the horde of fighters. As the fighters took damage, the carriers were often forced to recall them. This reduced the overall damage of the cloud of fighters slightly, but not to great effect. As the battle wore on, two specific fleets emerged as the focus of much of the fire. On the attackers’ side, the Goonswarm Federation Machariel fleets drew most of the fire, their losses mounting as the fighting continued. On the defenders’ side, the Maelstrom fleet of Pandemic Horde/Spaceship Samurai seemed to be pummeled from every side. With almost two hours passing since the start of the battle, Escalating Entropy and Shadow Cartel felt confident enough to deploy their super capital fleet. The super carrier force entered the field, keeping close to its capital support, and joined the fray. The super carriers lent their fighter squadrons to the already massive force deployed by the carriers as the titans used their capital guns to target the battleships and fire. It was at this point that server performance dropped considerably. While the battle from was fought with 10% Time Dilation from the start, according to several fleet commanders it was manageable. However, when the two hour mark was reached, the server seemed to have problem processing much of the data. Complaints about module cycles reaching upwards of 15(!) minutes and broadcasts not going through seemed to be commonplace. It became impossible to properly coordinate fire barrages, not to mention highlight targets. Even so, the two sides chose to carry on, doing their best to keep inflicting losses. Hundreds of wrecks littered space around the anchored structure, the fleets moving through the cloud of debris as they kept adding more to it. The first fleet to break was the Pandemic Horde/Spaceship Samurai. Having suffered catastrophic losses, it ceased to be an effective fighting force and had to withdraw. That said, it was not about to stand down while the battle continued without it. With a cache of Hurricane battlecruisers nearby, the fleet’s pilots re-shipped and the force resumed the battle. All the while, the attackers kept chipping away at the structure of the Keepstar, getting it as low as 78%. Yet as the fourth hour of the fight rolled in, and with both sides exhausted, Pandemic Legion and Northern Coalition decided to intervene. Believing a capital and super capital escalation was at that point out of the question, the two alliances decided to help bring the battle to a close and secure the Keepstar. Jumping in, the combined super capital fleet materialized on grid, adding its formidable firepower to the mix. Having fought for three hours straight and suffering grave losses, not to mention forced to endure horrible server performance, the attackers chose to withdraw. One by one the fleets warped out, leaving the defenders to attempt to catch stragglers as they secured the field. With the attackers gone and the last stragglers dispatched, the defenders had managed to clear the field, allowing the Keepstar to online properly. With the Keepstar up and running, the defenders managed to add the strategic objective to their tactical victory. Thus, the many defending fleets departed the system, finally bringing the bloodshed in Vey to a close. Battle report for the Vey system can be found here. The main battle lasted for 3 hours, with Time Dilation being ever present, remaining 10% throughout, though at the 2 hour mark as reported above, server performance degraded and became nearly unplayable according to multiple reports. The system itself hosted more than 3,000 players at the height of the fight. Due to the presence of various alliances and entities, the information below is merely an estimation using the data gathered to date. The attackers lost an estimated 467 ships in the battle including 177 battleships and 24 strategic cruisers for a total of 128.78 billion ISK damage. The defenders lost an estimated 244 ships in the battle including 131 battleships, 11 battlecruisers and 4 strategic cruisers for a total 54.16 billion ISK damage. I’ll right away take hold of your rss as I can not to find your e-mail subscription hyperlink or e-newsletter service. Do you’ve any? Please allow me realize in order that I may just subscribe. strategies with other folks, why not shoot me an email if interested. post and also the rest of the website is also really good. meal!! But yeah, thanx for spending some time to discuss this subject here on your internet site. Hi there, I read your blogs like every week. Your story-telling style is awesome, keep it up! in time i am reading this impressive informative post here at my home. everyone else encountering issues with your website. Thanks – Enjoyed this article, is there any way I can get an email sent to me when you make a fresh update? Normally I do not read article on blogs, but I wish to say that this write-up very compelled me to take a look at and do it! Your writing style has been surprised me. Thank you, quite nice article. I’m impressed, I need to say. Actually rarely do I encounter a blog that’s both educative and entertaining, and let me let you know, you have hit the nail on the head. Your thought is outstanding; the problem is something that not sufficient persons are talking intelligently about. I’m very happy that I stumbled across this in my seek for something referring to this. and say I truly enjoy reading your blog posts. PQNERB Perfectly written content material, Really enjoyed reading.